History of the Sheldak Ranch! 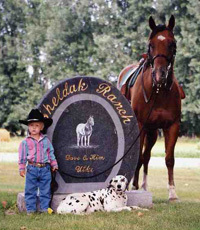 Sheldak Ranch is the birthplace of legendary Appaloosa horses with enduring, superior bloodlines. Since purchasing their first stallion in 1968, owners Dave and Kim Utke have focused Sheldak Ranch’s breeding program on producing well-built halter horses that can excel as riding horses in and out of the show ring. Breeding for conformation and disposition has always been a priority over color. Weanlings are sold each fall to eager buyers seeking horses with good looks, intelligence, athleticism, trainability, hardiness, and pleasant dispositions. Year after year, the national and world Appaloosa shows award Sheldak-born horses and progeny with championships across all disciplines. The stallions live on site year-round and carry the breed’s richest old-world bloodlines. Pedigrees trace back to many national and world champions and the most recognizable names in Appaloosa sires, including Bright Eyes Brother, Prince Plaudit, Acclaim, Joker B, Prince David, Mighty Tim, Spittin Image, King David, String of Stars, Skipper W and Mr. Exclusive — all going back to Old Fred. Sheldak broodmares are the epitome of the Appaloosa’s best qualities — hardiness, beauty and genetic vigor — characteristics readily passed on to their foals. Foals are born unassisted on the plains of North Dakota. Their innate people-loving personalities make them approachable within the first few days of life. They spend the summer with their dams in a herd setting in large pastures. The foals learn proper horse behavior from their elders and quickly accept the rigors of living life outdoors. By the time they are sold as weanlings, they are accustomed to heat, humidity, rain, snow, wind, insects, cattle and prairie wildlife — no wimpy horses come from Sheldak Ranch! Sheldak Ranch Appaloosas are born ready and willing do it all — for you. To find your next champion, click on "Foals for Sale" at the top of this page. To learn more about Sheldak Ranch, click on "FAQ" to link to articles. Sheldak Ranch and Appaloosa Horses…tried, tested, and true!